Speyside distillery Mortlach releases its oldest-ever bottling with the Mortlach 47 Year Old, the first of its newly-announced The Singing Stills three-part series. Mortlach, known to whisky connoisseurs as the “Beast of Dufftown” due to its big, powerful and meat whiskies, earlier this month announced the release of its Mortlach 47 Year Old. It is the first in the distillery’s new The Singing Stills series of three very rare single cask expressions, each of which have been – or will be – drawn from the last three in its inventory of casks that were filled in 1971. The series is so named for the Diageo-owned distillery’s set of six mismatched copper stills. The three wash still and three spirit stills responsible for its unique 2.81 distillation process hum in whimsical yet harmonious tandem when started up in cold Scottish weather. The first cask – a refill ex-bourbon hogshead – yielded just 94 bottles, all but one of which will be released for purchase via a global online portal by ballot. That one bottle was earlier auctioned off for charity and raised S$50,000 for Daughters of Tomorrow, a Singapore charity dedicated to support underprivileged women with the skills and confidence to make a living for themselves and their families. The remaining 93 bottles will be made available globally at a recommended retail price of £10,000 (around S$16,000) online. The ballot will managed by London-based rare and collectable wine and spirits merchant Justerini & Brooks. This extremely limited expression comes in a bespoke glass bottle with standout angular shoulders and enclosed in a smoky blue case with gold trim. 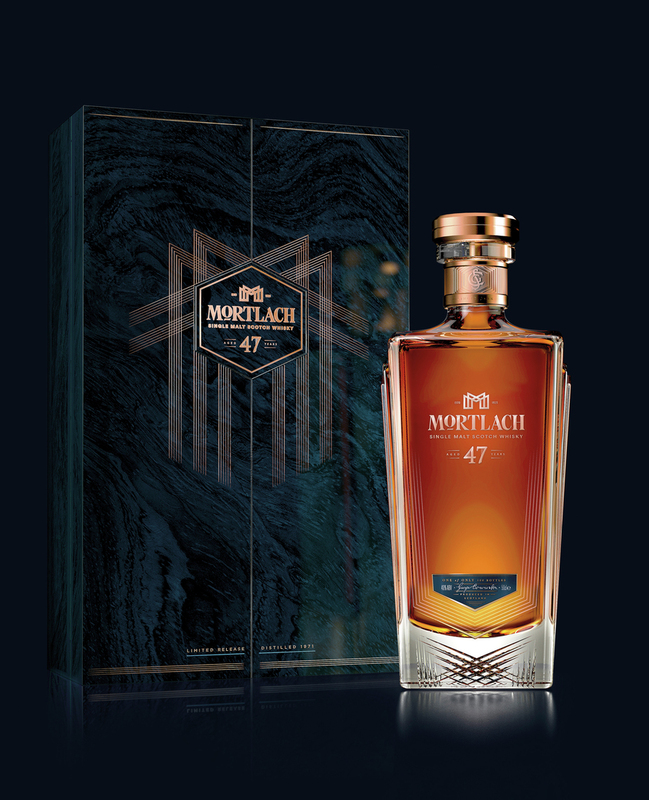 Those keen to ballot for a bottle of the Mortlach 47 Year Old can register their interest online here from 00:00 GMT on 9 April until 18:00 GMT on 23 April 2019.
nose Aromatic and exotic with orchard and tropical fruits followed by honey and waxy notes. Subtle spice notes emerge with sage, rosemary, incense and myrrh followed by a faint touch of smoke. palate Soft, ripe fruits with an intriguing combination of sweet and sour notes – umeshu plums and peaches are both present. These are balanced by firm tannins and a rich earthiness with just a little smoke. finish Earthy and spicy with a touch of wood ash. colour Late autumn sun striking burnished copper. nose Initial burst of toffee, vanilla and creme fraiche. A stone fruit compote – spiced with vanilla, ginger and cinnamon – follows. Body Medium-bodied, rounded yet sensual; oak character has overtaken Mortlach’s signature robustness and meatiness. palate One of those whiskies whose palate totally reflects the bouquet; this is peaches and cream, drizzled with some spiced honey and dusted with a touch of cinnamon sugar. Tangy and sweet all at once. finish Medium dry finish with a persistent wood spice character and a hint of oak. Its 46.8% ABV is well hidden, and surprising high considering its long maturation.